While the iPad is a great device for listening to music or watching movies and TV shows, one feature that it’s missing is the ability to stream music and video to it from an iTunes library on your computer. With Apple’s AirTunes feature, you can stream music from one library to certain devices, and you can also share an iTunes library on your local network to be able to listen to music or play video from it. But Apple left this functionality out of the iPad, treating it more like a mobile device than the replacement for a laptop that it will become in many homes. Given that the iPad doesn’t have a great deal of capacity—especially in the 16GB entry-level models—the ability to stream could come in handy. You may want to stream music to listen to while you’re reading a book, without having to worry exactly what music you last added from your plentiful iTunes library to the iPad. Or you may want to watch a movie stored on your Mac. As the saying goes, there’s an app for that—more than one, actually, although they’re far from perfect. For starters, there’s what you might called “passive” streaming of music from an iTunes library to the iPad. You can use Rogue Amoeba’s $25 Airfoil ( ), the latest version of which I discussed in a recent article, in conjunction with the company’s free Airfoil Speakers app (while not yet optimized for the iPad, you can run it in a small window or pixel-doubled mode). You're limited, though, to streaming from your Mac (from iTunes or any other similar app), and you can't choose what to listen to from the iPad itself. So while this is a good idea if you just want to use the iPad as, say, a speaker when you’re listening to music in the kitchen, it’s a bit limited for serious usage. But streaming both music and video is clearly something that interests developers. Two $3 iPad apps provide this functionality, in similar fashion, by creating a local server on a computer (Mac or Windows) and an app on the iPad to play the music or video: Matthew Gallagher’s StreamToMe and InMethod’s Air Video (there’s also an Air Video Free version that limits the number of displayed items in each folder). Both originated on the iPhone and iPod touch and have been updated as universal iPhone OS apps. The ServeToMe application is where you define shared folders. It also shows active streams. Both apps require free companion applications that you need to download from the developers’ Websites and install on your computer. You can share your entire hard drive, just your Music and Movies folders, or a specific folder of your choosing—the last option ideal, for example, to set up a limited selection of videos for a child who’s going to be watching on the iPad. With StreamToMe, you download the ServeToMe application, launch it, choose which folders to share, then just leave it running. On the iPad, you open the StreamToMe app, tap the name of the computer you’re sharing with, then navigate through its folders to find the content you want to stream. StreamToMe is good for video—though it can’t stream protected video files from the iTunes Store—but not so much for music. You can’t choose playlists, and you can’t even play the contents of a folder. If you play one song, the program stops afterwards and awaits your next selection. However, as far as videos are concerned, it plays all the main video formats (including some that iTunes can’t): MP4, AVI, MOV, FLV, MPG, MKV, and WMV. For music, it plays MP3s, unprotected AACs, and FLAC files. The Air Video interface on the iPad offers more options than StreamToMe. 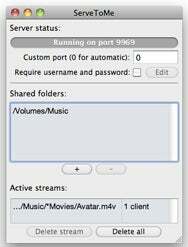 Air Video uses a program called Air Video Server, which only works for videos. Like ServeToMe, it lets you choose shared folders, but also lets you add iTunes playlists, though this feature is buggy. Air Video supports MP4, M4V, MOV, AVI, WMV, ASF, MPG, MPEG, MKV, 3GP, DMF, DIVX, and FLV formats (and, like StreamToMe, doesn’t play protected iTunes Store videos). 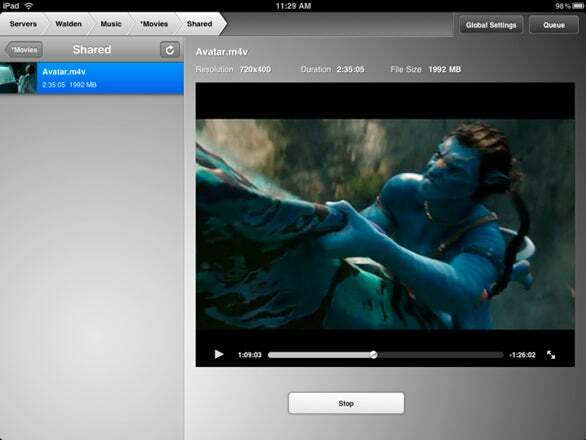 It does, however, offer some interesting features, such as on-the-fly conversion on your computer so the iPad doesn’t have to do so much work, and individual settings for quality, resolution, and zoom for each video. While none of these options mentioned are perfect, each of them has its advantages. I’d still like to see Apple provide a way to tap into my iTunes library, especially for listening to music while I read, but the ability of StreamToMe and Air Video to work with formats that Apple doesn’t support make them compelling choices for those who want to watch videos on their iPads. Generic Company Place Holder Air Video Free - Watch your videos anywhere! Generic Company Place Holder Air Video - Watch your videos anywhere!